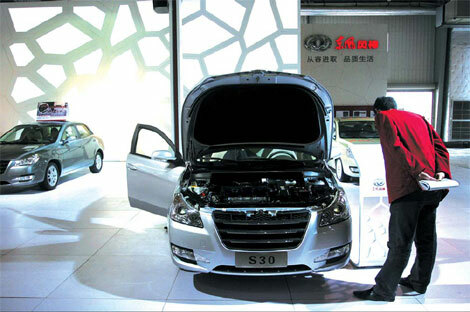 Dongfeng Motor Corp, China's third-largest automaker, sold nearly 1.1 million vehicles in the first five months this year, a 64 percent increase over the same period last year. In May alone, the company reported sales of 207,764 vehicles, up 37 percent from a year previous. The company said it aims to deliver 220,000 vehicles by the end of this year, 17 percent more than last year. Last week the company began construction on plant that will make engines for its own-brand passenger vehicles when production begins in the last half of 2011. Two Dongfeng models launched last year - the Fengshen S30 sedan and H30 hatchback - registered sales of 33,000 cars by the end of May. Both are currently equipped with engines made at the joint venture between Dongfeng and its French partner PSA Peugeot Citroen. Dongfeng's joint venture with Nissan Motor posted sales of 272,600 cars between January and May, an increase of 51 percent compared with the same period last year. The venture broke ground on a new 5 billion yuan plant in Huadu district, Guangzhou, last month. When it begins production in 2012, the new facility and the joint venture's existing plant in Huadu will have the capacity to produce more than 600,000 vehicles a year, making Huadu the biggest automobile production center in south China. Dongfeng's partnership with PSA Peugeot-Citroen recorded a robust 57 percent growth so far this year, with sales by May reaching 150,100 units. Two of its high-end products - the Dongfeng Citroen C5 and Dongfeng Peugeot 408 - are both enjoying brisk sales. Dongfeng Honda Automobile Co, a joint venture between Dongfeng Motor Corp and Japan's Honda Motor, sold 104,100 cars in the first five months this year, an increase of 42 percent over the same period last year. Dongfeng Yueda Kia, a three-way tie-up between Dongfeng, China's Yueda Group and South Korea's Kia Motors Corp, saw sales skyrocket 94 percent to 135,800 units in the first five months. The joint venture rolled out its one-millionth auto last week, eight years after it made its first car in China in 2002. The company also has several commercial vehicle subsidiaries with January to May combined sales of 287,700 units, a surge of 74 percent over a year ago.